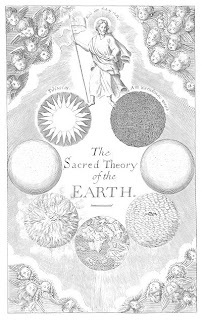 October 23, has become famous by (non)geologists as earth's birthday - largely due the brief mention in textbooks of the Irish Archbishop James Ussher's (1581-1656) work published in 1650 as the "Annales veteris testamenti, a prima mundi origine deducti" (Annals of the Old Testament, deduced from the earliest beginning of the world). Ussher presents a possible chronology of the 6.000 years old history of earth and humankind based on references in the bible and research of others scholars of the time (most influential was John Lightfoot - 1602-1675 - who published his calculations in 1644). For Ussher and other scholars it was important to know the age of the earth to possibly infer the time of the rapture. As for god a day is like thousand days and he needed 6 days to create the universe, the world would was created 4.000 years before Christ and last for 2.000 years after. The exact date given by the Ussher-Lightfoot-Chronology - October 23*, 4004 B.C., at nine o'clock in the morning - has become ridiculed by scientists as the futile attempt to determinate natural facts only based on the interpretation of Bronze Age myths [* or 6 p.m. October 22, 4004 B.C. according to the Jewish calendar]. However considering the time and the purpose of the work, Ussher's attempts were not too farfetched - his conclusions were based on the information that was available at the time and served well the theological questions that they should help clarify. Also this age was not universally and uncritically accepted- there were many earlier attempts to determinate the age of the earth and many concluded that earth was significantly older than known human history. Also during and shortly after Ussher there were serious doubts on the veracity of the 6.000 years time interval, manly due the observation in nature and outcrops. 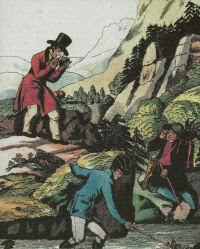 For example in the book "A Tour through Sicily and Malta" the stratigraphic research by the Sicilian Canon Giuseppe Recupero (1720-1778) on the slopes of Mount Etna is mentioned. Recupero discovered a succession of seven lava flows, he dated the youngest to the second Punic War (218 to 201 B.C.) and therefore the oldest could be 7x2.000 years =14.000 years old. Finally on March 17, 1785 a man will propose a new modern approach - "we find no vestige of a beginning, no prospect of an end." Fig.1. llustration from Thomas Burnet´s book "The Sacred Theory of the Earth", published in 1684.